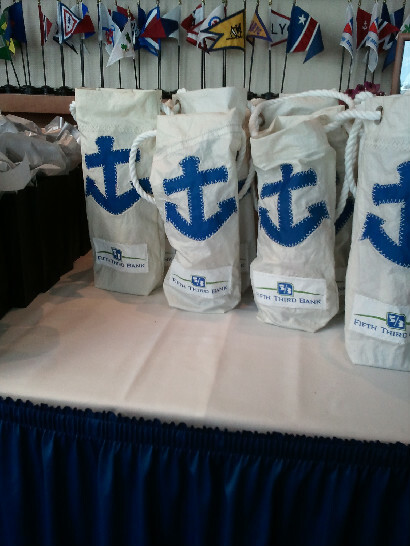 Fifth Third Bank held an appreciation event for Admiral Travel at the Sarasota Yacht Club. The theme was "Around the World," featuring 3 countries: India, Thailand and Spain. Tricky one: how do you design with such a contrasting color theme without it looking like a bad 80s movie? I don't usually like to mix all of these primary colors... but in this case, it worked. We ended up finding common colors that tied everything together in a way that worked. The bank provided these awesome tote bags made of recycled sales. How cool is that?! A space, is a space, is a space. It's amazing what one can do with a blank canvas like the Municipal Auditorium. The historic "gym" like building, known these days for it's monthly antique shows and other community gatherings, was transformed by the hands of Ashley Grant into a hip and chic party venue last Saturday night at SRQ Magazine's annual Hot List Party. Add some white drapings to devide the space into intimate rooms, place some colorful LED lights, throw in live art instalations, the martinis of course... and you've got yourself a hot party. 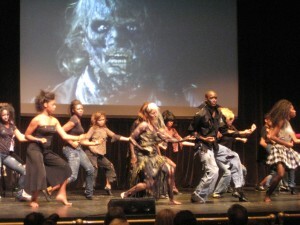 I never got to properly thank Fuzion Dance Artists for doing such a great job recreating Michael's Jackson's Thriller for the John Landis Tribute at the Sarasota Opera House during the SFF 2010. So here it is.... A big thank you! Well done.